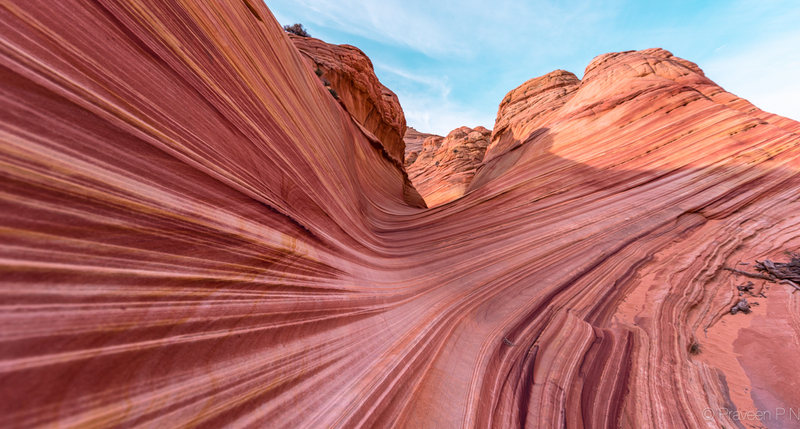 The Wave – North Coyote Buttes is an otherworldly sandstone formation in the state of Arizona, United States. It is part of the North Coyote Buttes in the Paria Canyon Vermilion cliffs wilderness. Having seen the amazing Antelope canyons, I definitely didn’t want to miss out this strange and spectacular art-work by nature. And this dream became reality on the third of July. We got the walk-in lottery permit to the Wave. Yay! There are only 20 day-use permits issued for Coyote Buttes North (The Wave), ten out of which are given out online four months in advance. The remaining 10 permits are given out in a lottery at the Grand Staircase-Escalante National Monument visitor center in Kanab, Utah. Read all about the Coyote Buttes permit here. Till date, this is our most rewarding hike. Though the wave is small in size, it turned out to be bigger than what we had expected. Those perfect curves were mesmerizing! We would rate this hike to be an easy one—hardly any change in elevation and easy to walk on sandstone, except for a short distance which is sandy. With no marked trails, it’s thrilling to be in the middle of nowhere and find your way to the Wave. Of course, we had the BLM map and GPS. I do not have any tricks to win the permit, but here are a few tips to prepare for the hike. Firstly, I would strongly recommend to visit the BLM office to check the road and weather conditions. If it has rained in the surrounding areas, a drainage on House Rock road (when coming from Highway 89) leading to Wirepass trailhead can be flooded making it impassable even for a 4×4. In this case, it is advisable to take the longer route – Highway 89A through Jacob lake, and then continue on road 1065, House Rock road to reach the trailhead parking lot. Check the weather conditions for this area. It is best to visit the BLM office as I have already mentioned. There are no marked trails, follow the map given by BLM; it is accurate and very helpful. You can always carry additional maps, GPS, etc. If at all you are unsure of anything, there are guide services available. We were recommended two tour companies – Dreamland tours and Kanab tour company. Registered guides don’t need an additional permit to accompany permitted hikers. Of course, carry enough water for each person. There is no drinking water available anywhere, not even at the trailhead. By reaching the trailhead at sunrise you have enough time to wander around the Wave and escape the harsh heat later during the day. At around midday you get the best pics when shadows are less. There is a Second Wave, Melody arch, and Dinosaur tracks; none of which we could find. Ask somebody at the BLM office for directions to these spots. The arch you see from the Wave is Top Rock arch. Even though your target is to find the Wave, don’t forget to look around and enjoy the colourful landscape; there are some unique plants, bunnies hopping around, colourful desert lizards, good-looking buttes with all kinds of designs, colorful lines and patterns. Some buttes have maroon-ish polka dots. Once you are here, you begin to appreciate the 20 people daily limit. This is one hike I wouldn’t mind doing again. Don’t fret if you don’t get a permit; spend a day in the beautiful Zion national park or the magical Antelope canyons. All the best for the lottery. Now I REALLY want to go. Thanks for sharing the fabulous photos! I’m glad you liked it Ingrid. It’s a wonderful place and you should keep trying for the lottery…you never know when luck shines. Very attractive photos! Thanks Anna! Those pictures are insanely amazing, I want to go there! Thank you. Yes you should definitely go there; good luck with the permit. Incredible pictures! I want to go there now! Thank you. I say, don’t give up! ?? Wow. This a amazingly beautiful! I have never seen anything like this before–lucky you! Yeah it is! Antelope canyons in Arizona is somewhat close, but yes this place is extraordinary! Thank you. ? Thank you! Yes, it definitely is – unreal and out of this world. These are the most amazing photos!! Wow, that looks so incredible and beautiful!!! !